What Will Be The Repercussions Of The Facebook American Idol Marriage? 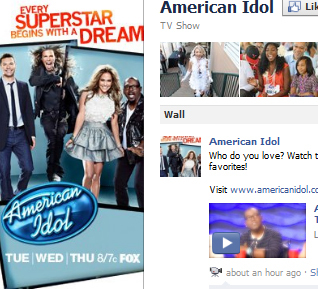 Plans to make it possible to vote on American Idol through Facebook came to fruition this week. That’s supposed to be good news but on the other hand it does mean that there will be another season of American Idol. But anyway, back to the case in point. Facebook voting commenced on Tuesday March 1 and those who choose to vote online get 50 votes which they can use throughout the series. Viewers simply need to log into their Facebook accounts and open the American Idol voting page on their website and drop their ballot each night the voting is open. The concept is interesting but the voting process could throw up some quite different voting patterns than the show currently experiences through telephone voting. If you have two or more accounts it’s possible to vote many times, even if you’re not a viewer of the show you could still be involved in the voting process if there’s a campaign to get rid of a particular contender if you happen to have an internet enabled phone. Perhaps American Idol have contingency plans to stop these sorts of vote rigging, perhaps they don’t care. This sort of thing will cause controversy, the media loves a controversy and Idol loves the media. Since the only winner is Simon Cowel’s record company it really doesn’t matter to the producers who come first in the vote. Cowel’s co-opting of the Christmas charts in the UK over the past few years led to a backlash in 2009 when music lovers began an internet campaign, also on Facebook led to Rage Against The Machine got the top spot. In 2010 the efforts to reclaim the Christmas charts were too diffuse and Cowel won again with another of his vehicles, X Factor. So the top dozen male contestants gave their solo all to impress the new judges and the new online voters too. Of course viewers can still vote by SMS and by phoning in, it’s hoped that the diffusion of voting into the net will mean that all the phone voters will be able to get through rather than being confronted by network busy messages as happened in previous series. But what does this new collaboration really mean? Apart from ensuring that American Idol will be around for another couple of years, the justification being “Look at our web traffic! You can’t argue with figures like that!” Well, it means that your online voting habits will be collected (come on, it’s a ballot for a flash in the pan, not the president, you think it’s going to be anonymous? Your preferences are worth a fortune) and used to market pop culture fluff directly at you for the rest of your life. The technology to let web users influence the way TV shows develop will also be interesting to watch. Lost was a series that had to undergo rewrites and plot changes when spoilers were released on fansites meaning it became a confused missmash of themes and sub plots. Well, I hope that’s the reason it ended up that way. Allowing the viewers to dictate the progression of a series will further degrade the written quality of TV production, and heaven knows there’s precious little of that left already. Dan Cash would rather sit in a room full of faulty washing machines fighting raging vacuum cleaners than have to listen to any more of that! Haven’t they’ve seen this holes before they accepted voting? Its unfair you know. I am using this social media site called the facebook, but i never knew this before, maybe once you have double account in this social media site, it is perfect to vote.